We awoke this morning to another dull and damp day, but a much warmer one and thunderstorms were threatened for later but failed to arrive. We merrily started washing the boat when the harbourmaster came and pointed out that the supply was for drinking water only but I got over that by connecting the hose to our deck wash facility and then topping up our tank again afterwards! We soon started our trip on a day so misty that I felt it necessary to start the radar for the journey. It was only six miles and took just an hour as we cruised past the Oude Haven and then pulled into the Buitenhaven entrance further south. 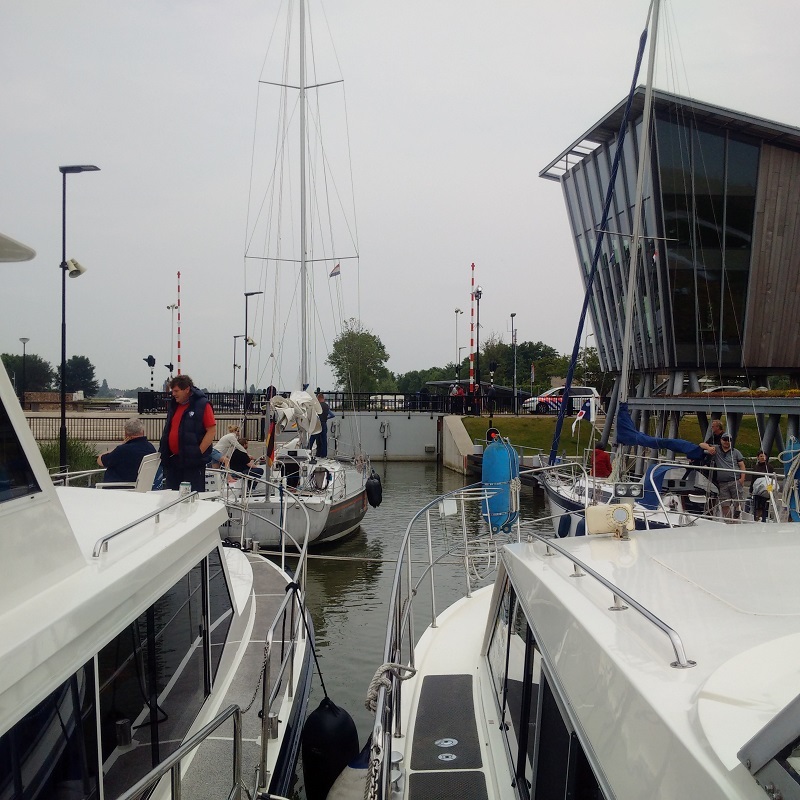 The sluis keeper responded on Channel VHF18 and invited us into the southern of the two locks but we could hardly see the entrance until we got there. We rafted against another large motor boat and saw three more vessels cram in behind us before the gates closed the 0.3 meter drop commenced. This was all very uneventful until it was time to leave when the stupid skipper of a German all-male boat tried to push through a gap which was not wide enough and scraped all along our vessel. I was furious and let him know by my signals that I thought so. There was no damage but the contact between us on the motor boat inside deposited a thick layer of antifoul on our hull transferred by the pressure, which took a while for us to remove later. 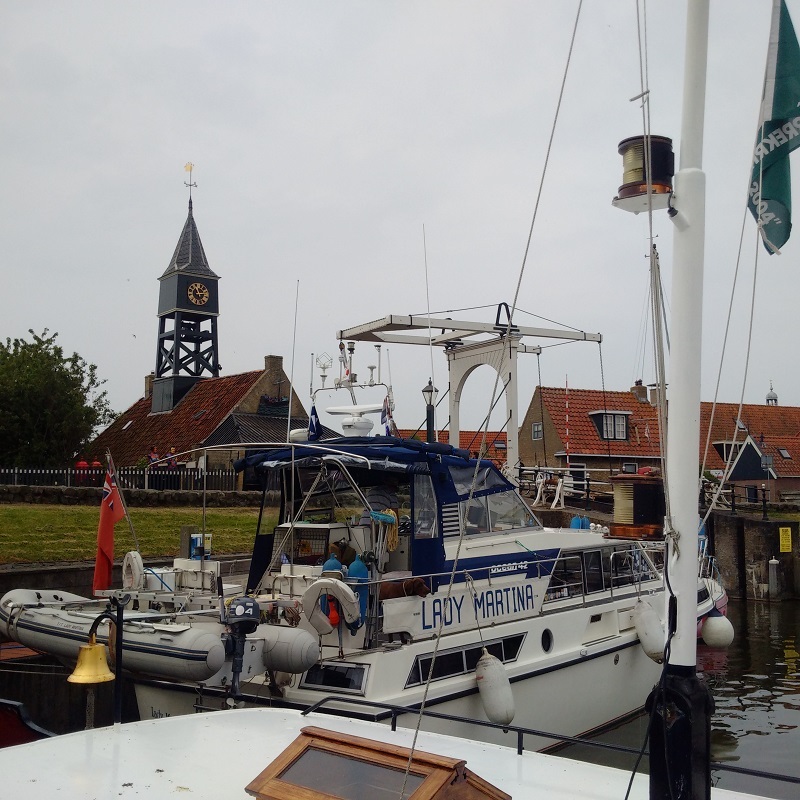 We moored on a pleasant grassed island in the Stavoren Buitenhaven with access to the shore by a small bridge and other boats with friendly dogs on board for Max to play with. We unloaded the bikes and went for a long ride around the town. Now, it was a Sunday out of season in June but, having said that, the best conclusion you could come to about this place is that it is a mere over-night stop-over location when en-route to somewhere more interesting! 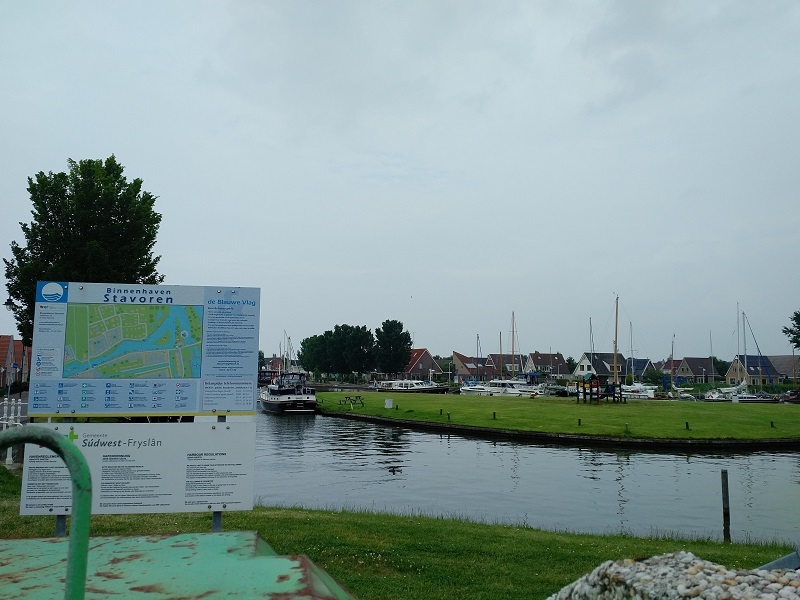 It is a quiet and pleasant enough place, and the Buitenhaven moorings are comfortable with unlimited electricity and a communal water point, but there is really nothing to recommend the place for tourism. Even the Tourist Information place specialised to selling tickets to leave the place by ferry, opened on and off through the day and had no stickers of Savoren.. I decided that we would just stay the night and leave along the canal inland tomorrow and see if we could get along to Workum. The moorings were nice and low and so we could get at Lady Martina’s port side; where the deposits from that incident were at their worst, and we successfully cleaned them off and polished the side accordingly.